I want to add one or 2 more microphones to my karaoke machine but it only has one jack. Is there some kind of splitter I can get to add more mics? Welcome to the forum! I remember participating in karaoke nights as a kid and having the time of my life rocking out on the microphone. My voice wasn't nearly up to par back then, and I'm not so sure it is now either, but it was still loads of fun nonetheless. While I know we carry headphone splitters, I do not believe microphone splitters/adapters are something we carry. That said, I'm still happy to help you figure out what exactly you need. 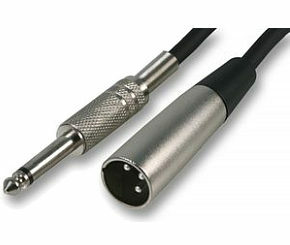 Most microphones have either a quarter-inch (¼”) or XLR cable attached. Do you happen to know which of the two your microphone has? I’m including a picture of each below for your reference with the quarter-inch input on the left, and the XLR input on the right. Thank you! It is the one on the left...the male plug in. Thanks for following up with me on this! What you would want is a quarter-inch splitter with two female inputs and one male output. I can't guarantee that this will work with your karaoke machine, as most splitters are designed to split audio out and not in. It doesn't hurt to try though, right? I'm afraid my suspicions were correct that we don't carry this particular kind of adapter here at Best Buy, but I'm sure your local audio equipment store would have some available. If there's anything else I can do to help, please don't hesitate to reach back out. Thank you so much, Sam! I appreciate your quick response! I will find one.